I love this quote, as written on the front of Dominio de la Vega’s press kit. I love the idea not only because it incorporates a sense of wine being an intregal part of life, but also because it celebrates the act of seeing wine as merely a drink. 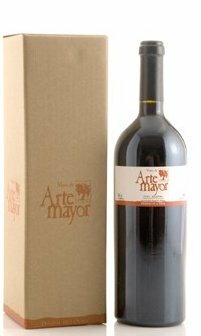 The only value wine has is that for which you choose to place on it, and I choose to place a damn fine rating on this particular bottle of Arte de Mayor 100% Bobal. Arte Mayor is the higher end line of wines produced by Dominio de la Vega, consisting of both a Cava Brut Nature and a 100% Bobal. We have both written and posted a podcast on their Cava, but have not as of yet, shared our experience of the Bobal. Bobal is a red grape varietal typically producing deep and concentrated red wines that are primarily found in Alicante, Utiel-Requena and Valencia. It is widely planted for bulk wine, and only until recently, has been associated with more fine wines. In all honesty, it’s a wine you want to have with a big juicy grilled steak, which is good considering that is exactly how we had it, sans the barbecue. We paired the pan grilled steak and mushrooms with a creamy blue cheese and butter sauce and a simple salad with an olive oil and cherry vinaigrette dressing. The dark berries and herbal notes paired well with the charcoal flavor of the steak, despite the delicate and elegant mouthfeel that felt like raindrops on a waxed car over my palate. Although slightly pricey at 50 Euros a bottle (I guarantee part of that price is in relation to the sheer size of that “stupidly heavy bottle” – as quoted by Tim), it’s a good wine, a good expression of Bobal, and something I would happily drink as long as I wasn’t forking out the money. The Bobal is a coupage made from 2002, 2003 and 2004 vintages of 100% Bobal fermented in french oak. The color is incredibly concentrated inky purple. The nose is evolves over time, slowly allowing aromas to escape one by one: black olives, menthol, black minerals, wet earth and bitter chocolate. Good body, elegant mouthfeel but a powerfully short finish. Intense flavors of spice, chocolate and licorice on the palate. Complex without being overwhelming.